Fall is approaching and a Central Coast trip is looming in the near future. There is no better time to travel in California than Autumn, crowds dwindle down, the light gets warm, and offshores start to flow. This is an image from a late October run a few years back. 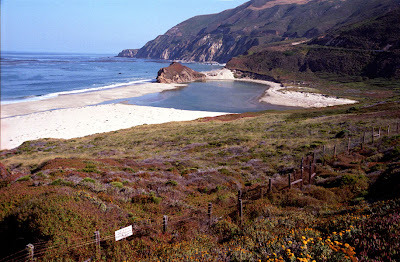 This little beach is pristine California coast as it is part of a private ranch and off limits to most. 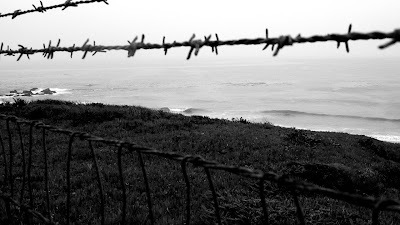 That freshwater pool looked so inviting and I debated hiding my rig and trekking into the time warp mysticism of Big Sur beauty, but tales of your car not being there when you get back from such trespassing jaunts left me shooting from the roadside. The beachbreak on the left side of frame gets really good too, and its also off limits. I don't know if you'd want to surf there though, I hear that they used to chum for Whitey right offshore.